It is known that gripping pencil correctly can improve handwriting, general comfort and flow of writing. Many educators believe that it can help with the overall brain development as well. Thus we can see that many parents are struggling at what age should their child be holding the pencil correctly and how to train them to hold it correctly? Some parents think that incorrect grip may be hard to rectify later while few are also worried for their child who are left-handers. But children develop skills at different pace so do not worry or pressure your children before they are ready to learn to write. Children develop their pencil grip development at different stages – from palmer grasp, pincer grasp, to eventually the tripod grasp. The tripod grasp is considered the desired pencil grip which the pencil is loosely held between the thumb and first two fingers. The key is not to grip too tightly. When a child has white knuckles, holes in his paper, or frequent snaps from the lead in his pencil, you can bet his grip is too tight which indicates weak fine motor skills. Thus even before your child begins to write, we should build on their fine motor skills through activities such as lacing, threading, or sorting small objects like paper clips. Then we encourage the correct pencil grip by supplying him with jumbo crayons and paintbrushes. Some parents may think that it is a disadvantage for children who are left-handers and may even pressure them to change into right-handers. However it is absolutly not true and not necessary to stress them. If not they may even lose interest in learning to write. 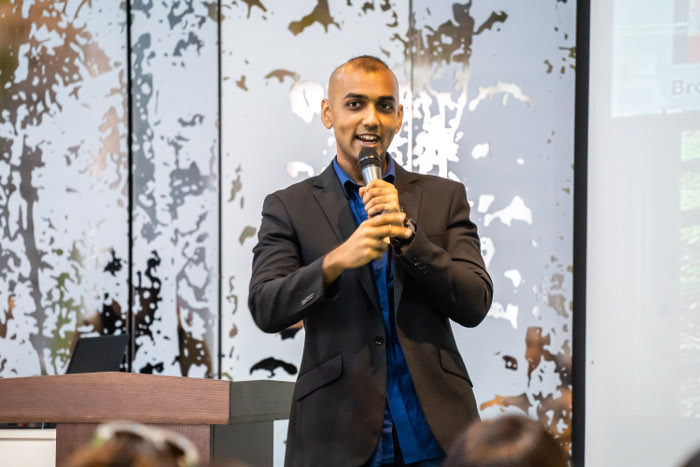 They may face more obstacles in learning to hold a pencil but all they require is the correct guidance, to place their paper and ideal position of their wrist, arm and shoulder. Parents need to teach them using mirror image of everything that is taught to a right-hander. Other than that they should be learning to grip the pencil in the same way as a right-hander would. Thus here is a review on the GROOVE coloured pencils which is designed to help children learn the correct grip the natural and fun way. – An innovative set of Three-sided ergonomic shape designed colour pencil. 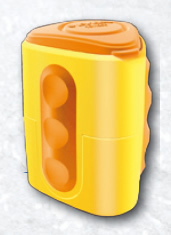 – Each color is designated with natural grip zone with no additional materials needed. 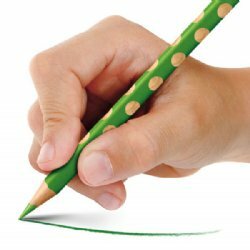 – It provides a non-slip side holes for the thumb, index and middle fingers which are used in a proper pencil grip. – The natural grip zones are still located in the correct positions and provide optimal writing hold even after sharpening. – Other accessories are Groove Sharpener /Groove Twin Hole Sharpener. 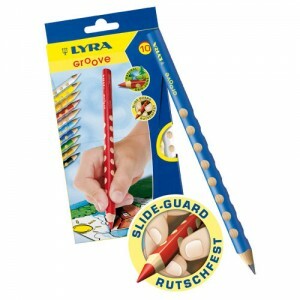 The GROOVE coloured pencils is suitable for children aged 3 years onwards. This is the age when children are slowly developing from their immature grasp thus with GROOVE the feel of the natural grip zone helps to modify children’s positioning of the fingers as they will understand without being told that their fingers should rest in the comfortable grooves provided. Even an adult like me is fascinated by the holes on the colour pencils and are interested to place my finger on it. So no additional pencil grip is needed anymore as it is in built in an environmentally friendly way. As mentioned previously some children might grip the pencil too tense but with GROOVE circular depression and triangular design it helps to teach children to relax their hold and also prevent their fingers from slipping off continually which reduces the chance of them gripping it too tightly. The triangular shape makes it comfortable to grip and also prevent it from rolling off the table. Next, for parents with child who are left-handers, the GROOVE naturally allows fingers involved (index, middle finger and thumb) to rest just where they should be, no matter the child is right- or left-handed. Moreover, even after sharpening, the grooves are still located in the correct positions. It is also easy for parents to point out and demonstrate how the pencil should be held so no more complicated instructions for children anymore. 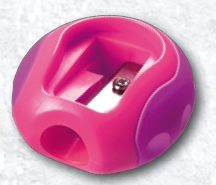 In additional, the two sharpeners also have soft rubber grip zone at the side of the sharpener which provides a good grip for children too. It is important to start good writing habits in the beginning thus it is strongly recommended that parents invest in GROOVE for children to learn the correct pencil grip independently while they immerse in the joy of writing, colouring or drawing. Groove is available in box of 5 colours, box of 10 colours, Graphite Writing Pencil, Single-hole sharpener and Twin-hole sharpener.